The south coast of Turkey from Kas to Antalya. Scale: 1 : 193.000. Larger scale plans of Kekova Demiryeri, Kemer marina, Finike, Ucagiz Limani, Antalya, Setur Antalya Marina, Approaches to Kas and Megisti. For this 2014 edition the chart has been fully updated and modernised. 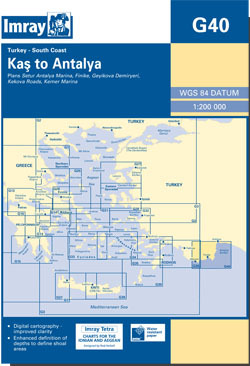 The latest known depths are shown around Kas, Kekova Roads and Antalya Harbour. Harbour depths at Üçagiz are also displayed, as are the recently deployed AIS transmitters across the chart.